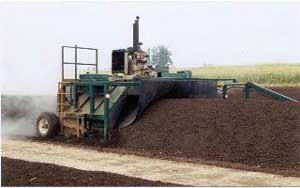 We build the world's finest windrow turners and have become the leader in composting equipment. This hard-earned distinction comes as a result of our innovations, ingenuity, rugged design, and our commitment to the people we serve - our customers. Our tow-behind windrow turners are built with the same quality and toughness as our self-propelled turners and will provide years and years of dependable service. Tunnel - 12' wide x 5' 6" high, adjustable to 7' 6"
Tunnel - 14' wide x 5'6" high, adjustable to 7'6"
Frontier Industrial Corp., 192 Young Street, Woodburn, OR 97071. Tel: 503-982-2907; Fax: 503-982-5449.